Complete deforestation of the Amazon rainforest could reduce rainfall in the Pacific Northwest by up to 20 percent and snowpack in the Sierra Nevada by up to 50 percent, suggests new research published in the Journal of Climate. 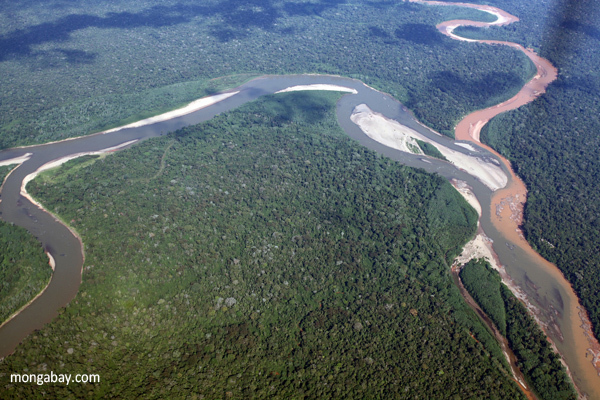 The study is based on high resolution computer modeling that stripped the Amazon of its forest cover and assessed the potential impact on wind and precipitation patterns. While the scenario is implausible, it reveals the global nature of the ecological services afforded by the world’s largest rainforest. Reduced rainfall and snowpack could also increase regional vulnerability to fire and affect energy production since much of California and Washington’s power comes from hydroelectric dams. (Left) This figure shows the change (in millimeters per day) in daily average precipitation after total Amazon deforestation compared to before deforestation. The pink to dark-pink range indicates a drop in precipitation of up 1.6 mm less per day once the Amazon is gone. Areas with statistically significant changes are hatched. 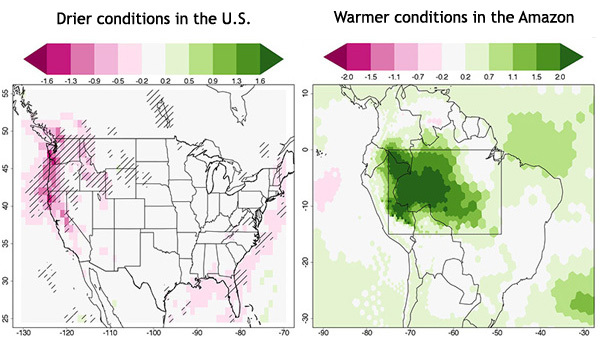 (Right) The researchers’ model indicated that the surface temperature in the Amazon region would increase by up to 2 degrees Celsius (darkest green) over a 14-year period following deforestation. The region of Amazon deforestation is boxed. Caption courtesy of Princeton University. The Amazon pattern would be subject to the same meandering high-altitude winds known as Rossby waves that distribute the El Niño system worldwide from its source over the Pacific Ocean. Rossby waves are instrumental forces in Earth’s weather that move east or west across the planet, often capturing the weather of one region — such as chill Arctic air — and transporting it to another. Because the Amazon pattern forms several thousand miles to the southeast from El Niño… the Rossby waves that put the rainy side of El Niño over southern California would instead subject that region to the dry end of the Amazon pattern. The pattern’s rainy portion would be over the Pacific Ocean south of Mexico. The findings build on earlier research published by study co-author, Roni Avissar of the University of Miami, which has indicated that rainfall in the America’s Midwest is affected by forests in the Congo, while forests in Southeast Asia influence rain patterns in southeastern Europe and China. Although the new study uses a rather extreme scenario in order to tease out the potential impact of Amazon deforestation, the idea that the great rainforest could see its role as a giant water pump greatly diminished is not without reason. Several models suggest that climate change, when combined with large-scale deforestation and forest degradation, could indeed cause large expanses of the Amazon to “tip” from rainforest to much-drier savanna, dramatically altering rainfall patterns. While it was generally assumed that such a shift could have a cataclysmic impact on agriculture in South America — 70 percent of the continent’s GDP is produced within the rainshadow of the Amazon — the new study shows that the effects would be felt on a much wider scale. CITATION: Medvigy, David, Robert L. Walko, Martin J. Otte, Roni Avissar, 2013: Simulated Changes in Northwest U.S. Climate in Response to Amazon Deforestation. J. Climate, 26, 9115–9136.